Today I have found a sense of hope for eating out and staying healthy…as well as a new favorite restaurant in which I will soon become the equivalent of Norm from Cheers! 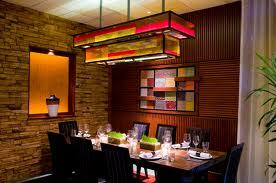 This wonderful place is called Seasons 52. Upon entering the building I was hit with a great atmosphere. Classy and sophisticated for an older crowd, yet still fun and inviting for a younger crowd. Really the best of both worlds. The restaurant featured a giant wine room that housed their award winning wine selection – 60 wines by the glass – and a bar that enclosed a piano for live entertainment. Our server was extremely knowledgable (and being a server myself I am very judgmental towards others), and gave us a great run down of the history of the restaurant as well as the way the menu works. The name Seasons 52 comes from the idea that their main menu changes with the main seasons and the small section on the side of the menu changes 52 times a year to accommodate the always changing fresh seasonal foods. Naturally, being August, I got to choose from the Summer menu. This menu featured items anywhere from Organic Edamame, Organic Lemongrass Salmon, to Oak-fired Buffalo Burgers with guacamole and roasted pepper salsa, and a spicy sour cream! Here’s the kicker and the part that really got me excited…everything on their menu is natural or organic and 475 calories or less! After the crash course on the menu ceased we got to the important stuff, ordering our wine. Our server let us taste three of the four Pinot Grigios before making us finally settle on one. (They were all so good)! 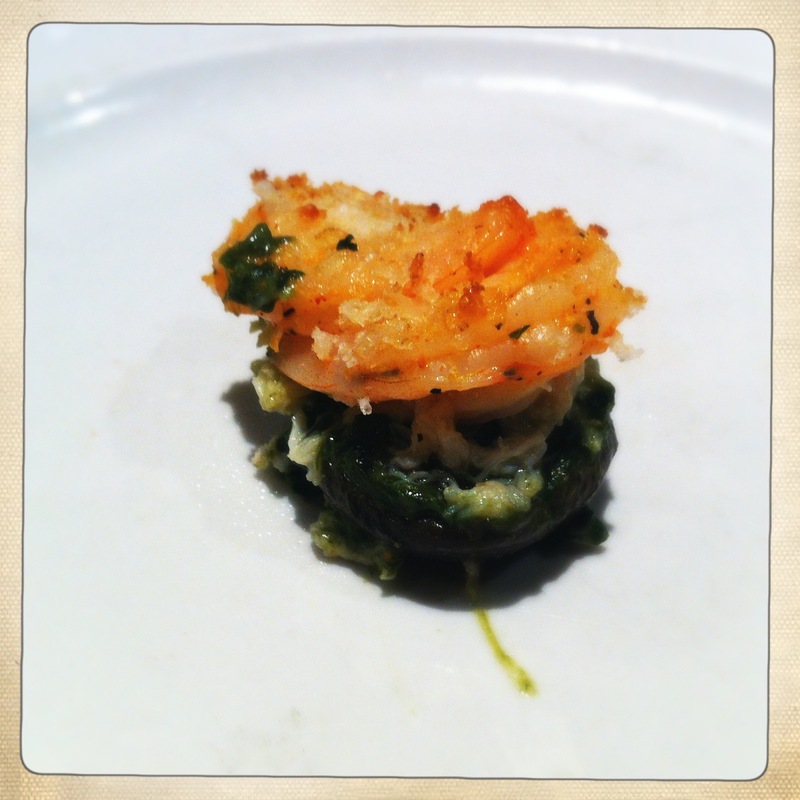 To start we ordered The Maryland Crab, Roasted Shrimp, and Spinach Stuffed Mushrooms, under Parmesan-Panko Crust. One bite and I became one of those creepy patrons who had to take a picture of everything before I ate it…or at least before I ate all of it. Sadly, I only got to take a picture of one of the five stuffed mushrooms. The others were devoured too quickly. I had to convince my mother we didn’t need a second order of this phenomenal appetizer. After much blood, sweat, and tears, we finally decided on one entree. How could I pass up an opportunity to get a 475 calorie or less burger? So I settled on the Buffalo Burger mentioned earlier, while my mother settled on Stuffed Poblano Peppers. I use the word “settled” very lightly here as it tasted like anything but settling. My burger was tender, juicy, and just simply incredible. The guacamole had great flavor without taking away from the taste of the buffalo burger and the roasted pepper salsa and spicy chile sour cream packed a good punch to clear the sinuses. It came with a fresh side salad which I gobbled up equally as fast. 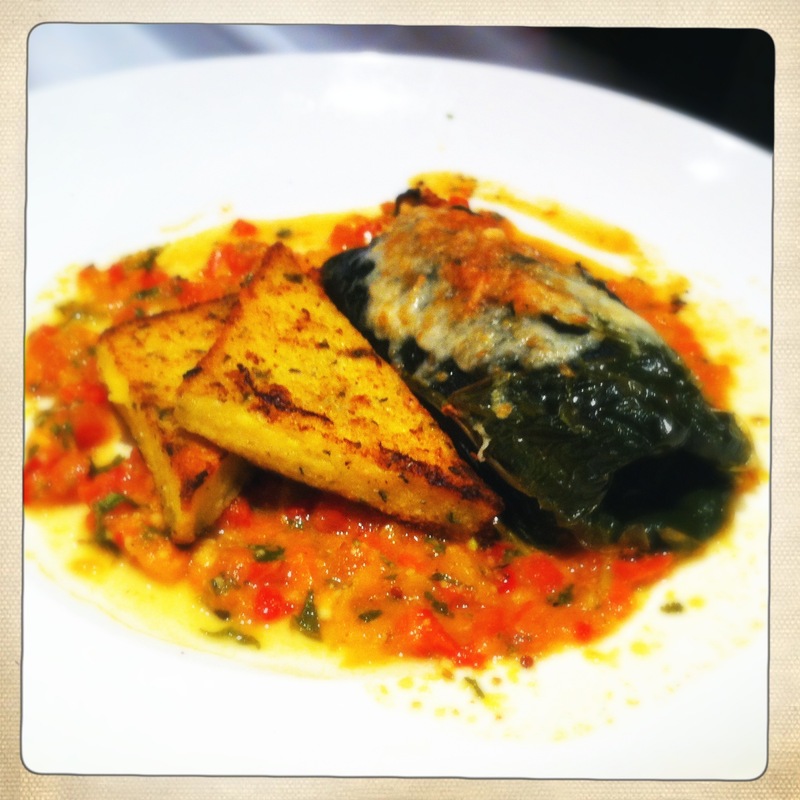 The poblano peppers were just as stimulating to the taste buds. It will be hard not to order the same exact thing next time, but I’m determined to taste everything on the menu! 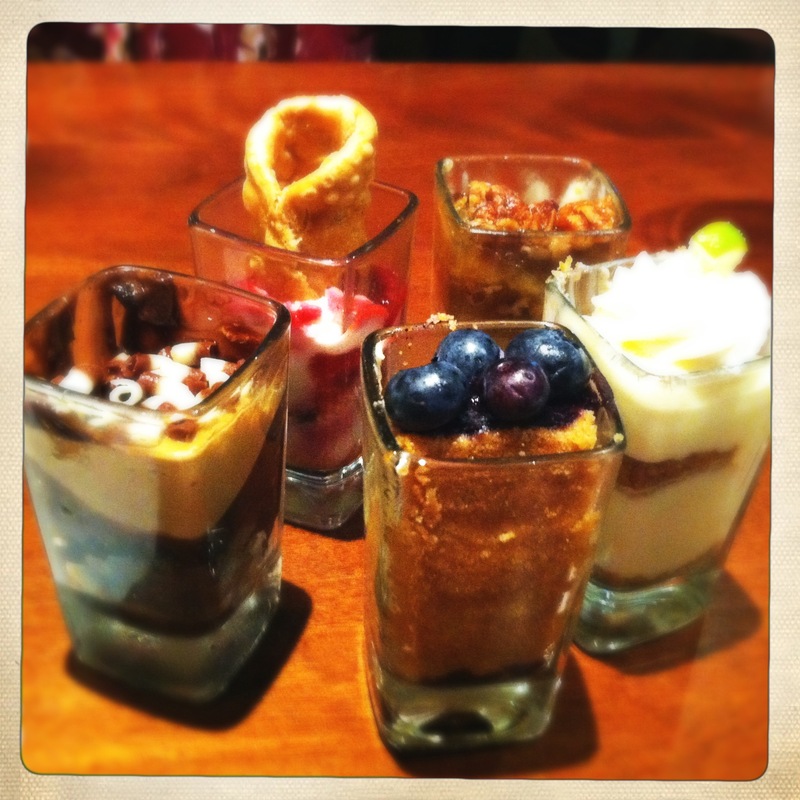 I was sufficiently stuffed after my appetizer and entree but when does that ever stop me from getting a dessert…or five. (guilty face). How can you not when they are only $2.50 a piece and well under 475 calories! Hey, we’re only human. 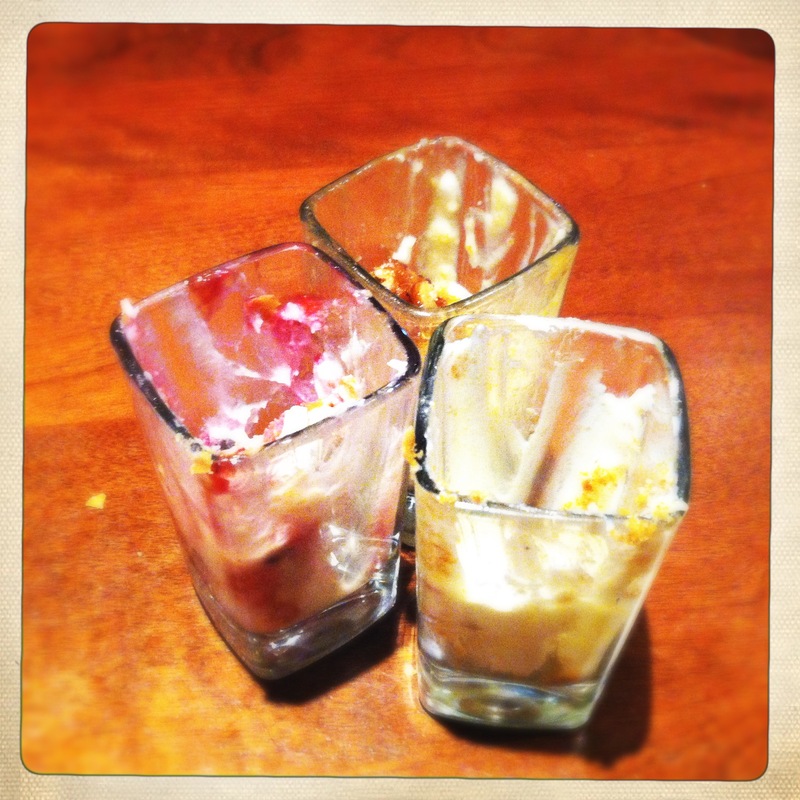 Why are there only three of five empty dessert shot glasses you ask? Well, it was a blood bath between the two of us for the first two desserts and once they were devoured, our server removed the evidence from the table. In other words, he took them away before I could capture the picture. Overall, our dining experience at Seasons 52 was beyond incredible. I can’t wait to go back again…and again…and again. Especially when they change out their menu to fit the fall season. After all, it is my favorite season! I highly recommend checking out one of Season 52’s many locations around the country…or at least their website to peek at their menu and find a location near you! 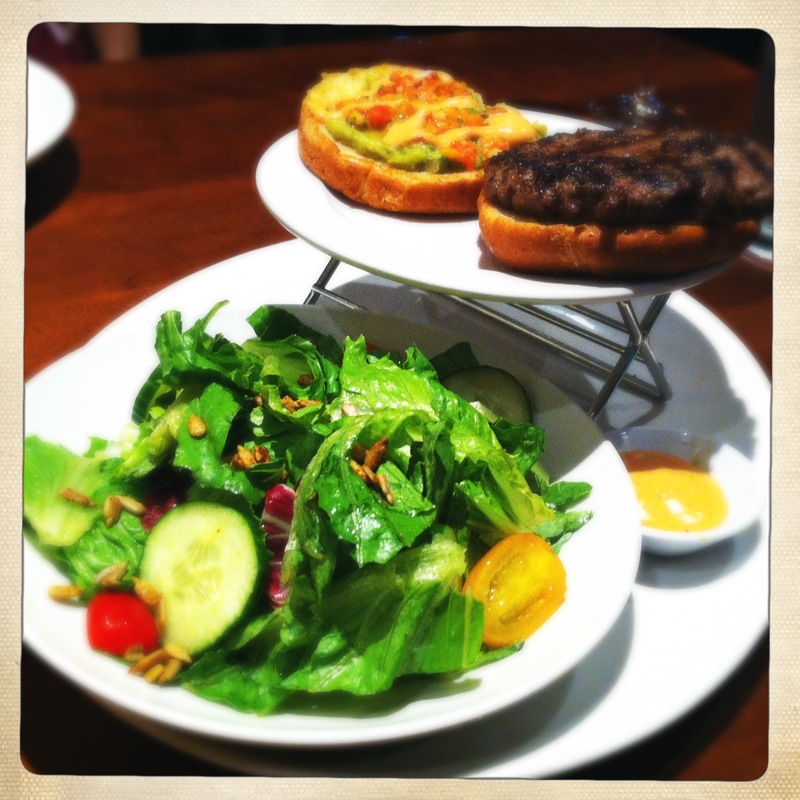 This entry was posted in Nutrition Facts and Tips and tagged health, low calorie, nutrition, restaurant, review, Seasons 52. Bookmark the permalink.